Vitalicious is a reputable company that deals with delicious and nutritious baked food items that promote a healthy lifestyle. The store is a pioneer in marketing high-calorie food items having a low-fat content and high concentration of fiber and nutrients. The online store was founded in 1999, and it sells nutritious baked goods of various brands such as VitaMuffin, VitaTop, VitaBrownie, VitaCake and VitaMuffin Mix. Goods can be purchased online or from various outlets nationwide. Vitalicious is also renowned for its Nutraceuticals, which are enriched with minerals and vitamins and are useful in maintaining health and preventing illness. Each and every variety of VitaMuffins manufactured by Vitalicious is enriched with 15 essential vitamins and minerals and is certified by the USDA. The products sold by Vitalicious are available in a variety of flavors such as multibran, apple berry, cran bran and blue bran, each having its own unique taste. The Vitalicious website is quite informative and easy to navigate. 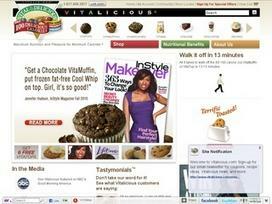 The various categories of Vitalicious such as VitaTops, VitaMuffins and VitaBrownie are placed under separate links. Each of these links opens up to a new page with detailed information on that particular brand. Find out about the nutritional content, such as the calorie, fat, fiber and protein content of the featured products from the website. Besides these, the website has separate links related to the various products, latest recipes and store locations. You can check the order status at any point of time during the transaction through the Track Order link. For purchasing a certain baked food item, you can click on the Shop Now link. To know more about the store's shipping policy, the shipping info link can be useful. Vitalicious is your ideal destination when it comes to delicious baked foods! The baked items are not only tasty but rich in nutrients, minerals and vitamins. Shop for your favorite VitaTop flavors such as BlueBran, CranBran, MultiBran, Deep Chocolate and Golden Corn. Delicious VitaTops are also available in Chocolate Fig, Triple Chocolate Chunk, Fudgy Peanut Butter Chip, Apple Berry, Dark Chocolate Pomegranate, Low Carb Velvety Chocolate and Double Chocolate Dream flavors. Vitalicious offers a wide range of mouth-watering VitaMuffin mix recipes such as Vitalicious Red White and Blue, VitaMuffins Buttermilk Jelly Bean Cupcakes, Carrot Crunch Muffins, Pumpkin Harvest Muffins, EyeBall Cupcakes, Rocky Road Muffins, Minty Chocolate Cupcakes, Carnival Nutty Fudge Brownies, Fluffy and Delicious Blueberry Pancakes, Cran-Blue Mini Muffins, Toasted Snowberry Nut Cake, Pepperminty Chocolate Cupcakes and Classic Banana Nut Breakfast Loaf. Vitalicious products are made from natural ingredients and do not contain any added preservatives. For expedient shipping services, each state has a select day, or the day on which orders are processed and shipments are made. For any type of queries, contact the customer care representatives of Vitalicious by e-mail or by phone. Share what you think about Vitalicious, and your favorite ways to save there! both my husband and myself love the sugar free muffin tops ,our only wish is that they make them in more flavors .we can only get the deep chocolate ones in sugar free .